You can't swing a fluffy unicorn these days without hitting a training camp preview, so rather than subject you to yet another round of position breakdowns and statistics, over the next few days I will be taking a look some issues and questions I see smoldering just beneath the surface. Hey, you never know from whence the Next Big Story might come. Next to the addition of a perennial Pro Bowl QB Donovan McNabb, the change at the top—the hiring of GM Bruce Allen and Head Coach Mike Shanahan—is the single biggest story in the Redskins universe. Plenty has been written about the impact the future first-ballot Hall of Fame Head Coach will have on the team, and rightly so. There are some angles we hear very little about, however. The kinds of things it is easy to brush off here in the warm fuzzy glow of the honeymoon between coach, team and fans, but should surprise no one in retrospect if and when they come up over the coming months when the Shanahan Era record no longer sports a shiny "0" in the loss column. Looking for monsters behind every tree? Perhaps. A nod to the reality that even steely-eyed future Hall of Famers are, at the end of the day, human beings? ● Mike Shanahan made his NFL bones developing quarterbacks. The man won thirteen games with Jake Plummer one year, and eleven another year with Brian Griese (fer chrissakes). He hasn’t had a quarterback with the pedigree of Donovan McNabb, however, since Hall of Famer John Elway retired in the afterglow of his second consecutive Super Bowl victory in 1998. Once the fur starts flying for real, will Shanahan find it difficult to resist the temptation to work with McNabb himself? And if so, exactly how would that play out with new offensive coordinator Kyle Shanahan? It isn't like the younger Shanahan is just another legacy hire; Kyle is fresh off turning out the league's top passing offense (fourth overall) in 2009, with QB Matt Shaub at the controls, for the forgettable Houston Texans. How will the Washington Redskins do this year? 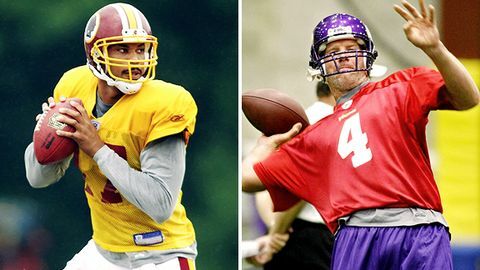 Given their circumstances—coming off an ugly 4-12 season, replacement of their head coach, general manager and (apparently) entire modus operandi, installation of new systems on both sides of the ball, new quarterback and multiple additional new players—how exactly should one define “success” for the 2010 Redskins? By wins alone? By some subjective assessment of "progress?" Scenario 1: the Redskins start fast, say 5-3, stumble a bit down the stretch as the league gets a book on them, but claw out a tough win in the finale to go 9-7 and grab the final playoff spot. They then lose a lackluster road Wildcard game to the Eagles, 19-10. Scenario 2: the Redskins start slow, say 3-5, struggling to find their new identity, but recover to go 4-4 over the tough second half of the season, including two solid wins against good teams to close out the year, and finish 7-9. Sitting here today, which scenario would you define as more successful, hopeful, preferable?